Background & Objective: Due to increase in number of cardiac catheterization procedures safety concerns is an issue nowadays. Multiple diagnostic modalities use radiations, which also put a patient at higher cumulative radiation exposure. Therefore steps should be taken to minimize radiation exposure during cardiac catheterization. Hence determination of factors which prolong FT will result in better understanding of problem.This retrospective study was undertaken to determine factors responsible for prolong fluoroscopy time in patients undergoing coronary artery catheterization. 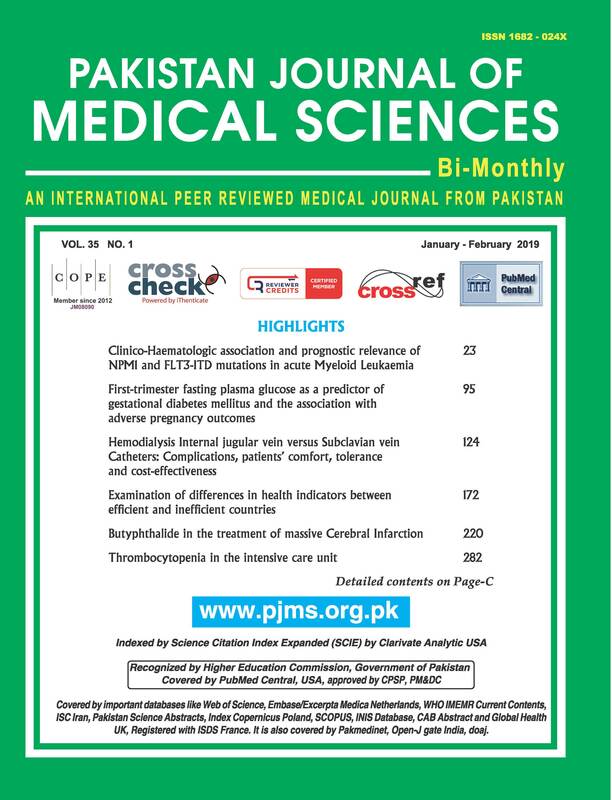 Methods: This retrospective study was conducted at catheterization Laboratory National Institute of Cardiovascular Diseases, Karachi from June 2014 to June 2015. Patients of either gender, aged between 18 to 90 years undergoing cardiac catheterization procedures were included. Radiation exposure time was measured in terms of fluoroscopy time. Results: A total of 957 patients were included in this study out of which 731 were of diagnostic Coronary Angiograms (CA) and 226 were of Percutaneous Coronary Intervention (PCI). The mean age of the study participants was 54.12±10.89 years and majority 734(76.6%) were male. Mean fluoroscopy time (FT) in the patients subjected to PCI was 9.61±6.07 minutes while in cases for CA 4.17±4.13 minutes. FT for CA was observed significantly dependent on procedural access, operator’s experience, and LV angiogram. While FT for PCI was found dependent on number of stents deployed during the procedure. Conclusion: For invasive coronary angiographic procedures radial route increased fluoroscopy time. For percutaneous coronary intervention femoral and radial route fluoroscopy time were not significantly different.